Product information "Ergon SR Pro Women Road Bike Women's Saddle Stealth"
Designed and developed by sports scientists and industrial designers, tested to the very harshest by top riders of the Canyon / Sram UCI Womens Team, a saddle generation was created that combines maximum comfort with 100% race ability. All saddles of the SR series have been adapted to the specific features of the female anatomy. Women are much more mobile in the pelvic area. As a result, the pelvis tilts more often forward on the saddle. Due to its high flexibility, the saddle optimally supports these movements and compensates them. The ergonomic saddle shape distributes the pressure optimally over the seat bones and the large-area discharge channel does not even cause sitting discomfort and numbness. The Pro Women is equipped with OrthoCell © inlays in the genital and seating areas, which provide the best pressure distribution and maximum restoring force. The OrthoCell © material is also more durable and lighter than gel. The ergonomic sliding flanks reduce the friction when pedaling and the wide, short nose is directly another relief zone without disturbing edges. At the same time it ensures the best freedom of movement on the bike. 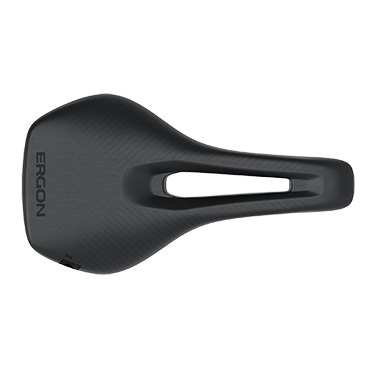 Related links to "Ergon SR Pro Women Road Bike Women's Saddle Stealth"
Customer evaluation for "Ergon SR Pro Women Road Bike Women's Saddle Stealth"